We currently have a limited remaining amount of vehicles that have been affected by the recent Sydney hail storms. This is your last chance to take advantage of our Hail Sale with great deals available until Tuesday 30th April 2019. With a 250 new, demonstrator and used vehicles affected in stock to priced clear. 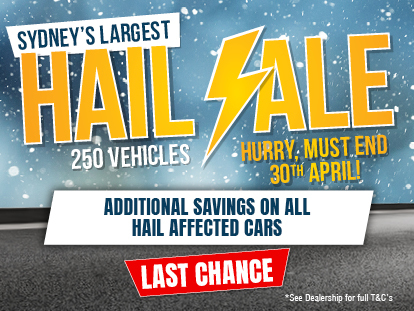 There will be additional savings* across a range of hail affected vehicles at our 3 locations, including Warwick Farm, Narellan and Campbelltown dealerships. Visit our friendly team today or Contact Us and a team member will be able to assist with further details on current stock available, including insurance options. Visit us today or call for more details! *A buyer discount applies to all hail affected vehicles sold. The amount varies depending on the extent of the hail damage. Only one buyer discount per hail affected vehicle sold during the sale event dates. Speak to one of our sales team about these offers. All affected vehicles will come with Dealership Sales contract Form 6. Sydney’s Largest Hail Sale event will end 5.30pm Tuesday 30th April 2019. Delivery dates may vary on hail affected vehicles, please refer to your sales executive/ team for further details. Offers exclusive to Peter Warren Automotive Holdings and reverses the right to extend or withdraw at any time.